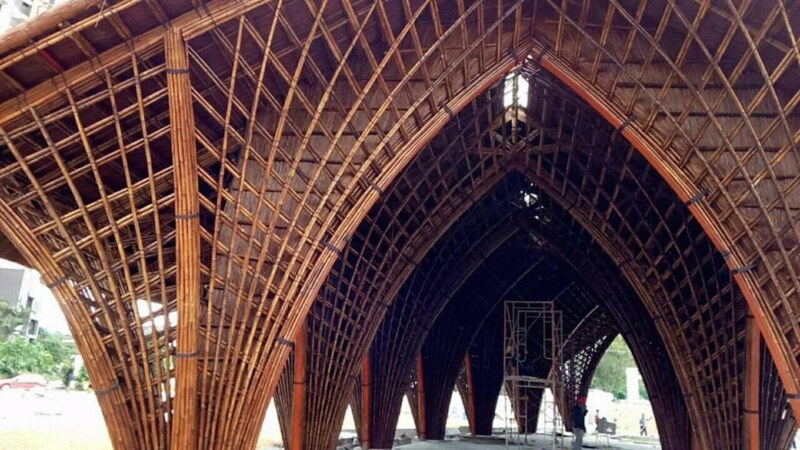 Our favorite Vietnamese architecture firm is nearing completion on a gorgeous bamboo restaurant in Xiamen, China. 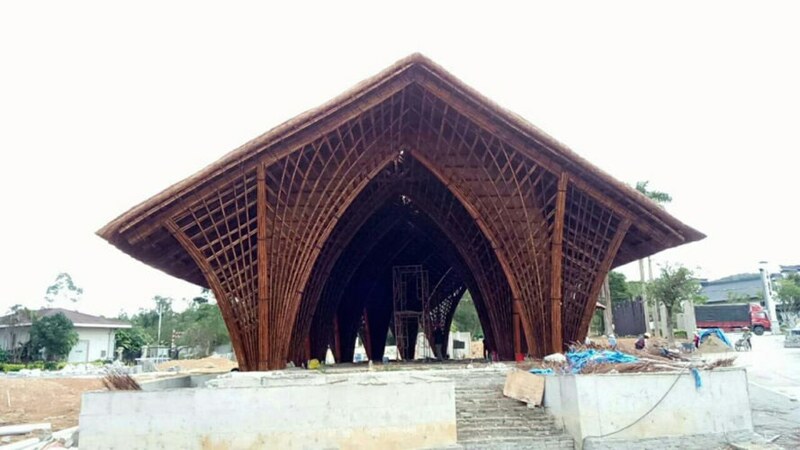 As reported in ArchDaily, Vo Trong Nghia Architects is close to finishing the Ting Xi Bamboo Restaurant, a striking building with capacity for 200 people. The sculptural restaurant champions the beauty and strength of bamboo, used in its 14 fan-shaped support columns. 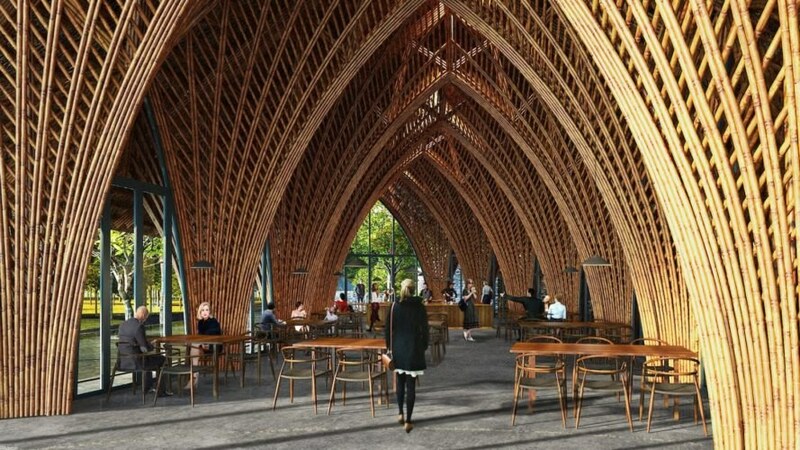 Bamboo is a favorite material of Vo Trong Nghia Architects. The firm’s eco-friendly work is helping to increase popularity of a renewable material that many Asian architects and developers dismiss as flimsy. At Ting Xi Bamboo Restaurant, the bamboo used is treated with traditional Vietnamese techniques to naturally improve the material’s strength and durability. The reinforced rods are grouped into 14 “quadrilateral” columns that fan out near the top to create dramatic archways down the center of the restaurant. The sculptural columns, spaced eight meters apart, support a pitched roof with a maximum height of 6.4 meters. Long overhanging eaves provide extra protection from the elements. The restaurant will also be slightly curved in plan so that a person standing at one entrance wouldn’t be able to immediately see the entrance on the opposite end. 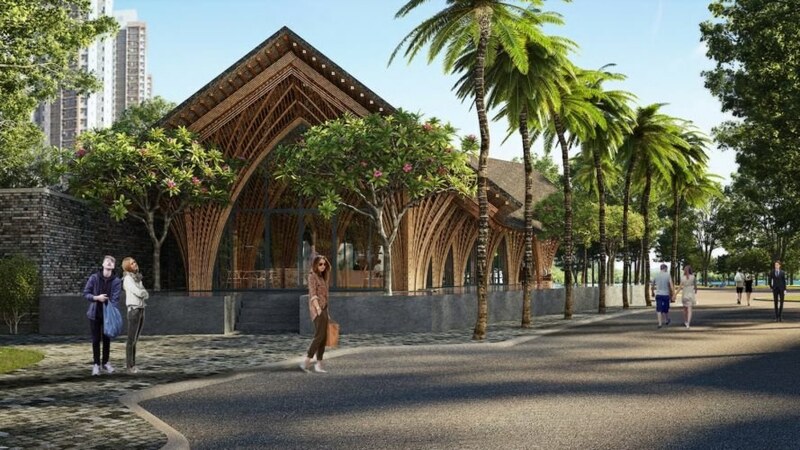 A smaller green-roofed building that sits behind the restaurant will be built of local brick and house the bathrooms, kitchen, staff room, and storage. A pond is located to the south of the main building. 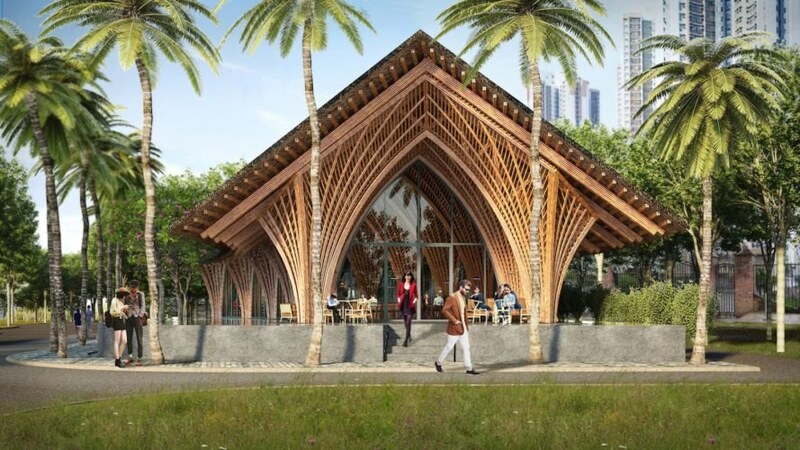 Despite its open-air appearance and the architects’ proclivity for breezy buildings, the restaurant will rely on air conditioning, not natural ventilation, for cooling, per the client’s request. Custom-cut glass will be fitted into the archways and skylights installed to let in extra light. 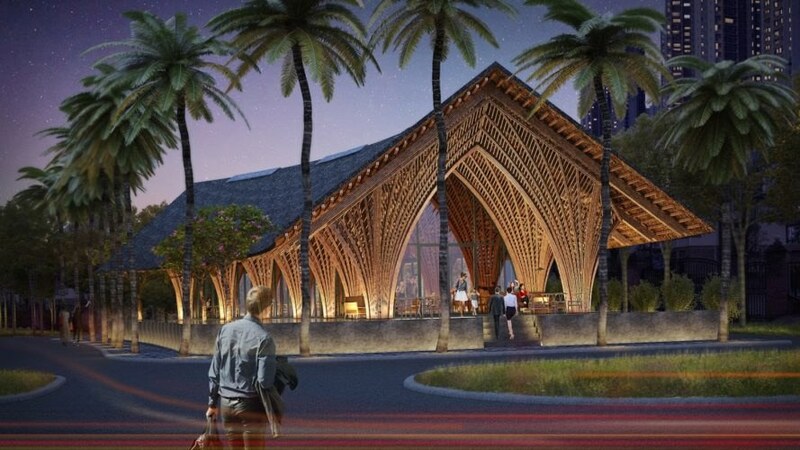 Bamboo is a favorite material of Vo Trong Nghia Architects. The firm’s eco-friendly work is helping to increase popularity of a renewable material that many Asian architects and developers dismiss as flimsy. At Ting Xi Bamboo Restaurant, the bamboo used is treated with traditional Vietnamese techniques to naturally improve the material’s strength and durability. The reinforced rods are grouped into 14 “quadrilateral” columns that fan out near the top to create dramatic archways down the center of the restaurant. The sculptural columns, spaced eight meters apart, support a pitched roof with a maximum height of 6.4 meters. Long overhanging eaves provide extra protection from the elements. The restaurant will also be slightly curved in plan so that a person standing at one entrance wouldn’t be able to immediately see the entrance on the opposite end.